Fakie wheelies just look surreal and seem to contravene the laws of physics: How could one possibly pedal backwards to perform a reverse wheelie with a freewheel that only engages forward? In essence, they are "just" a wheelie performed backwards, except that because you ride backwards, the free-wheel engages with the crank, forcing the crank arms into reverse motion. Reaching the right point of balance for a regular manual is tricky enough to learn in one direction, but having to back-pedal into thin-air to follow the pace of the crank arms just creates more distraction and is rather unsettling. Only tons of practise will help you get that evasive trick, but here are a few tips. Obviously, the fakie wheelie will only be possible with some backward momentum. This could be back-pedalling from a small endo, or back-hopping from a small step. But for the sake of learning, the least difficult start is to lean your front wheel against a wall and then energetically push yourself away from that wall. 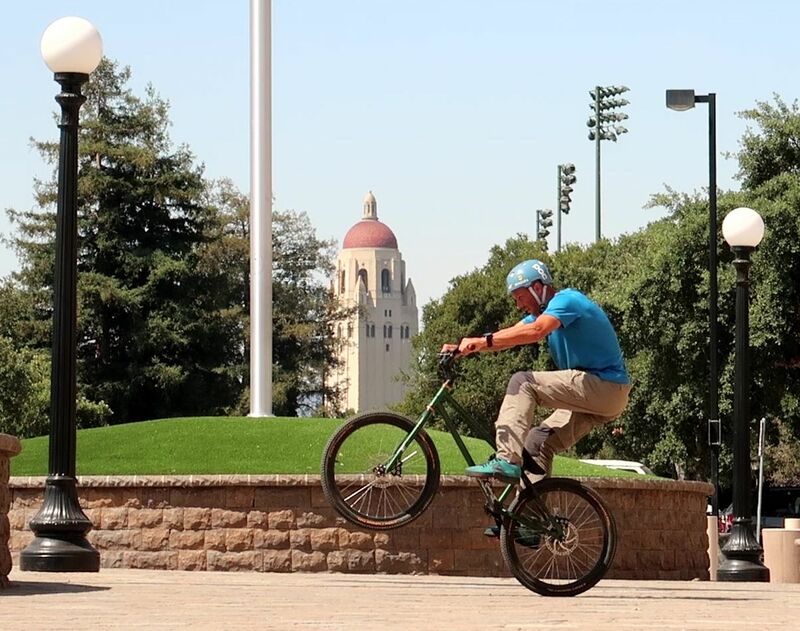 Alternatively, on a flat, you could also start with a small endo to gain backward momentum, but the transition to fakie wheelie is harder to catch. It does help if you launch this down a mild slope so that you continuously get some traction backwards. Focus on keeping your bars at the same level, let the pedals drive your feet. As you push yourself away from the wall, throw your torso away from the stem and swing your hips behind the rear wheel to pull up the handlebars and reach a "manual position", arms stretched. As soon as the front wheel moves up, you'll feel the pedals pushing backwards. Focus on pedalling backwards in exact synchronization with the bike's motion, letting the pedals drive your feet without ever applying pressure to stop them. Try to follow the pedals, giving way to the motion rather than backpedalling faster than necessary. Use the pedals' feedback to keep pace with the move and maintain your balance and position relative to the bike. Applying the slightest pressure on the pedals will slow the move, which you could use to your advantage either to slow down if you perform this trick down a slope or to adjust the bike's standing position (the more the pressure, the higher the front wheel moves up). 1° Hold a trackstand pressing your front wheel against a wall and lean forward to prepare for a push up. 2° Energetically push yourself away from that wall to build your backward momentum, a mild slope helps too. 3° As the front wheel moves up, focus on pedalling backwards in exact synchronization with the bike's motion. 4° Getting beyond the first pedal switch is probably the hardest part, be light on the pedals but actively pedal backward. 5° Use the pedals' feedback to keep pace with the move and maintain your balance and position relative to the bike. 6° In a slope, let the pedals drive your feet without ever applying pressure to stop them, forget the brakes, keep the handlebars level. In any case, never use the rear brake to control your speed backwards, a sudden stop of the rear wheel will throw you off balance on your back and even a progressive stop would deprive your senses from valuable pedal feedback. Instead, control your speed by resisting a bit more on the driving pedal (whichever is positioned in front of the other). The hard bit is to maintain the same light pedal contact as you switch your front foot (from your good to your bad foot), without ever getting stuck on your bad foot. So try to focus on following the pedals with your feet and you'll see some progress, from half a crank turn, to a full crank turn, to multiple crank turns. Once you get used to backpedal in tune with the crank's motion, try to let your feet loose and focus more on your balance, for example, keeping your handlebars at a steady level. This will be easier to visualize and focus on, and the whole move will look simpler to manage. On a flat ground, without the natural traction of a slope, the fakie wheelie is a little bit harder to maintain. The second you stop back pedalling, you instantly lose your backward momentum, and too much pressure on the pedals will just shoot out the bike in front of you. Once you get used to a flat start, try your luck back-hopping from a small step as a way to build up backward momentum and land directly into a fakie wheelie.